Finding the right commercial restroom supplies for your restroom design is easy when you call XPB Locker Supply. With so many options in every category of product, even people who have previously built or remodeled commercial restrooms can be overwhelmed. New products emerge on the market every month, and sometimes mistakes are made on blueprints that are not caught until after certain commercial bathroom fixtures and commercial restroom accessories have been ordered. This can perplexed even the most experienced of contractors, because the demands of project deadline compound the already problematic considerations of stall placement, lavatory installation, and accessorization of the restroom interior. Here is where XPB Locker Supply can step in and help. Since measurements are the most crucial element to any project, we want to start out by getting the right set of numbers straight so we can determine how to populate the facility within the parameters of available space. We have to make sure that what is installed actually works, looks attractive, and complies with all accessibility codes. If clients are not sure what to measure, or how to document measurements in challenging environments, we will help you. 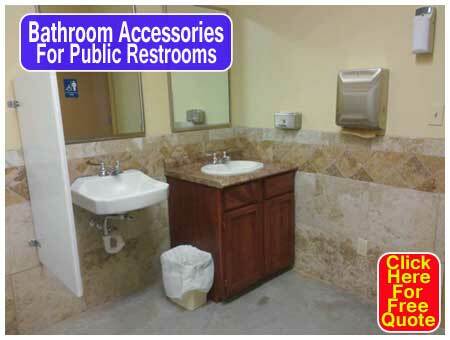 We will develop a CAD drawing that will detail the placement of all your commercial restroom supplies. Stall mounts and layouts will be specified, along with toilet stall accessories, vanity accessories, and lavatory system placement. The actual products will not appear on this document, but rather an itemization of product type that clearly shows the relationship between the parts and one another, and the relationship of each part to the whole. Changes are often made per client request to meet various traffic, code, and facility requirements. Once these changes are made, and the CAD drawing is signed off on, we can then begin the process of product recommendation. We seldom have only one type of commercial bathroom product to recommend to a client. In most cases, we are working with people on a budget that must carefully allocate funds whenever they purchase materials. Fortunately, there are multiple lines of fixtures and accessories in every product category, and a full spectrum of material options for partitions. Partitions can also be customized to the unique parameters of specific environments thanks to a wealth of hardware options. Lavatories and accessories can also be customized, or they can be swapped for less expensive equivalents that offer more or less the same functionality. This allows focus to narrow only to those commercial restroom supplies that fit the public restroom design drawing, yet it still allows for a great deal of flexibility when choosing individual line items. XPB Lockers carries a wide variety commercial industrial sinks, commercial bathroom equipment, commercial outdoor furniture, bleachers, and industrial warehouse equipment delivered nationwide. If you can not find what you are looking for Calll us toll free at 1-877-483-9270 and we will find it for you.